Joy and I went on our second trail ride this evening. This is hands down the easiest pony ever. She didn’t care about anything. She wasn’t quite brave enough to lead, but she was happy to follow her favorite gelding. The only thing that kind of made her hesitate was the horse eating rock. But all Joy did was march over and give it a good sniff. We even trotted on the trail some. Oh, and she even listened to me when I asked her to leg yield and bend! I was super proud of that. I wasn’t sure she’d respond to leg pressure the same in a new environment. She did. We did some mini leg yields down the trails whenever she got a bit nervous, and that brought her back to paying attention to me. Worked great. She only got nervous twice though. For the most part I held on to mane and gave Joy a long rein. I have to say… having a pony is fantastic. We were too short to need to duck under branches, we fit through the technical sections with ease, and the lead rider got hit with all the cobwebs. Haha. Normally on Ava, I spend 90% of a ride draped over her neck, or eating cobwebs. This was a very pleasant experience sitting upright the majority of the ride. I’ve been trying, for the past month-ish, to wrap Joy’s hind legs. She gets… jerky about her hind legs being wrapped. But my problem is my back starts hurting after a few minutes, and she’s jerking her leg around, and I end up giving up trying to wrap the backs. So today, I decided we were going to do this come hell or high water. We did have a stern talk on the first leg, but she quickly decided it was easier to let me fuss around with her legs. I think she looks very dressage-y in her white polo wraps. She also looks tubby… definitely not a hard keeper. She barely gets any grain. I don’t normally wrap. Usually, I’m in agony after hoof picking so I skip bandaging (my back just isn’t what it used to be). However, I want Joy comfortable enough with things on her hinds in case she needs bandages for wounds, or for shipping boots, etc. You know… normal horse stuff. Anyway, she forgot about them as soon as we walked out of the barn. No big deal. Mainly, I just wanted to ensure I could do it instead of waiting until it was a “had to” situation. And I still need to work on trailering. I dread working on trailering. I find that so nerve wracking. But… if all goes well, then she should be ready for her show debut come next spring, or early summer. 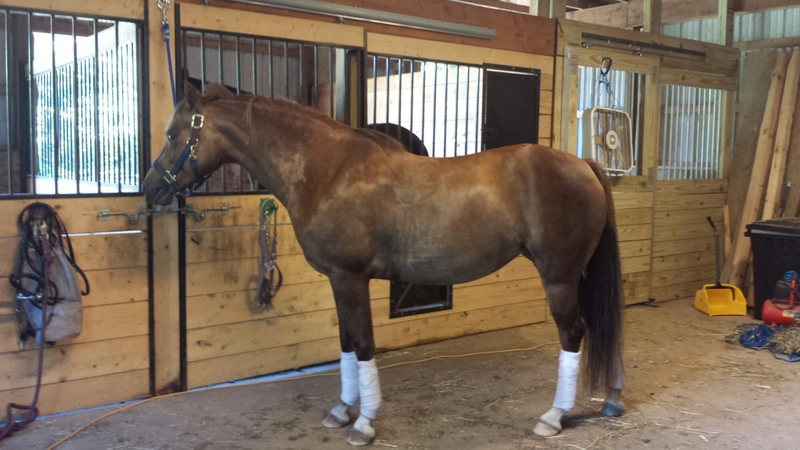 I haven’t been without an indoor arena before, so we’ll see how it goes…. ← Do you want to go Riding? I like using boots with velcro straps – quick and easy to put on and offer the legs some protection. Much easier on my back. She looks like a lovely pony! Such a good pony girl she is!!! Such a lovely looking pony! I can’t wait to see her horse show pictures next year! Being able to put things on their legs is so important. I’d get some fleece dressage sport boots or something similar that just velcro on. I think Schneider’s has them for $25. One of the horsey websites has them significantly cheaper than the rest. In the last 18 years of riding, I’ve done one winter without an indoor, and that was two years ago and I’m set to do it again this year (cross your fingers that ours will be built in time for some of winter!). It’s not as bad as you think, and since you have your horses on your property, it should be even easier for you to do than it was for me (I have to drive 45 min to the barn so no shot at a morning ride before work). My main problem was a lack of light. I even resorted to riding at night with my car’s headlight’s up against the fenceline! In winter we do lots of trail riding, and when the weather cooperates, I’ll work Mikey like normal in the snow (coating the sole in a ton of Vaseline stops snowballs in shod horses, you just have to make sure the hoof is super dry). I’m going to long line during the week this winter under my head lights and ride on the weekends when the sun is up. You just do what you can, and my horse came out of that winter in super shape and ready to work without any of that “it’s spring, you’re sitting on me outside” shenanigans. Good luck!